In June of 1987, a small group of strangers gathered in a San Francisco storefront to document the lives they feared history would neglect and celebrate the lives of people who have died of AIDS–related causes. Their goal was to create a memorial for those who had died of AIDS, and to thereby help people understand the devastating impact of the disease. This meeting of devoted friends and lovers served as the foundation of the NAMES Project AIDS Memorial Quilt. 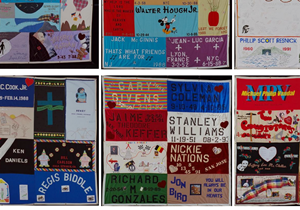 The AIDS Memorial Quilt returns to New York City for a two-day public display, featuring 260 12-foot-by-12-foot sections of this internationally celebrated, handmade tapestry. Presented as a gift to the city by Kiehl’s Since 1851, the Governor’s Island display will begin with a special opening ceremony/press opportunity at 4:30 p.m. on Monday, Aug. 11. This opening dedication is a part of the fifth annual Kiehl’s LifeRide for amfAR, a charity motorcycle ride that raises funds and awareness for amfAR, The Foundation for AIDS Research, which is dedicated to ending the global AIDS epidemic. The Quilt display is free and open to the public and will be on view from 10 a.m. to 6:45 p.m. on August 11 and from 10 a.m. to 4 p.m. on Tuesday, Aug. 12. The display will feature more than 2,000 panels honoring over 5,014 individuals including many created by and for individuals who call New York home as well as panels created by leading fashion houses like Giorgio Armani, Anna Sui, Ralph Lauren and BCBG to honor those in the industry who were lost to the pandemic. In recognition of the annual Kiehl’s LifeRide for amfAR, a new panel for The Quilt created by Kiehl’s will also be unveiled and dedicated at this event. If you are in or around New York City please go and remember and pay respects to those who we lost during the darkest time of our history. Governor’s Island is accessible by public transportation.